My friend is selling his home in New York and is giving serious consideration to Sarasota. I shared with him my high regard for you as a broker. Your patience, knowledge and help to us in the unfamiliar waters of Florida real estate procedures was wonderful. We wholeheartedly recommend you, Diana. I just wanted to take a moment to thank you for all you’ve done to help us relocate. You have been patient, enthusiastic and insightful. You have made this huge move for us so manageable because of your vast knowledge of the area and your sense of humor. Diana is very thorough and responds to every question in a timely manner. Her knowledge of the area has been exceedingly helpful for the out-of-town buyer. Diana was exceptional in the negotiating and closing process of our condo in Sarasota. Closing on the property was complicated and I am not sure the deal would have been completed without her tenacity and skill. I can say that this was the most pleasant and responsive agent I have ever worked with. We would highly recommend her without hesitation. Diana, thank you for introducing me to the Florida real estate market. I know my near future involves investment in Sarasota. Your kindness, personality and prompt work ethic make you shine so very bright in the world. Cheers to a vacation property! We do not know of anybody who is looking to buy in Florida, but if we hear of anyone, you are the first (and only) Realtor on our list. It was a great experience. We had the pleasure of working with Diane on the purchase of a condominium in Sarasota. Diane was exceptional throughout the process and I highly recommend her for your next real estate transaction. Our search for our home in paradise was truly enjoyable and we feel like we found the perfect property for our needs. She was responsive to our requests and listened to us on a very personal level. This attentive service made a long distance purchase so much easier. The final transaction was logistically challenging because of a lender error but Diane went the extra mile to make sure things moved along to completion. I am not sure we would have been successful without her skill and tenacity. Many thanks to her for all of her help.Hands down the best agent I have ever used. Michael, My husband and I want to thank you and especially Diana Kryzsack for her wonderful service and attention to detail. She yielded more than we expected for our condo and also found our new home. We love her! - Susan & Bill U. As you know a company's reputation is only as good as its people. We would rate Michael Saunders & Company with a 10+ and our experience has been with Diana Kryszak. Diana was there for us every step of the way. She guided us through the purchase offer step, was there for the inspection when we couldn't be, informed us of the suppliers for utilities, insurance, Bay Isle requirements, a good go-between with the seller, and was even there after the closing for repairs that needed to be finished. We know "today" that she is there to answer questions and do whatever she can to help us. As business owners ourselves we would be proud to have anyone like Diana on our team. - Richard & Sherri B. It is a pleasure to applaud the work of Diana Kryszak! This purchase was the fourth time we have bought a residence. Diana exceeded all expectations to assist us; doing such things has visiting a property and face timing us with pictures to be viewed in New York City. In other words, Diana did not try to sell us a house, she guided us to identifying a home. - Wayne P. and Richard R.
We have worked with some very fine realtors. But our experience with Diana brought a new level of service, expertise, and professionalism. She listened carefully to our questions and comments, and she used that information to provide us with an array of possibilities. After the close, she continued to provide us with service and recommendations that helped make this our new home. We thank you, Diana, for your tireless efforts and wonderful professionalism. - Lana & Mark M.
It was our good fortune to work with Diana. There is no better spokesperson for the city of Sarasota whose pride in this community colored every aspect of her service. Her knowledge and skill guided us through the selection process and purchase of our new home. 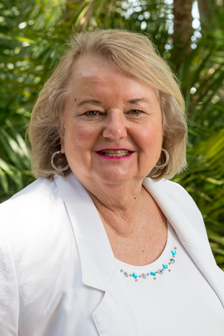 She happily and enthusiastically gave of her time and effort and introduced us to every aspect of life in Sarasota. The best attestation of her extreme value is our desire to be counted among her friends once we settle in our new home. Rita and Steve N.